How many Spanish-speaking countries are there in the world? Argentina, Bolivia, Chile, Colombia, Costa Rica, Cuba, Dominican Republic, Ecuador, El Salvador, Guatemala, Equatorial Guinea, Honduras, Mexico, Nicaragua, Panama, Paraguay, Peru, Puerto Rico, Spain, Uruguay, Venezuela. Of course there are many more countries where Spanish is widely spoken though it not being an official language. For example, Spanish was one of the official languages of The Philippines until 1987 so it is widely spoken there. Try our interactive Game about Spanish-speaking countries and their capital cities using the sentence “The capital of COUNTRY X is …” with 4 alternatives to choose from. 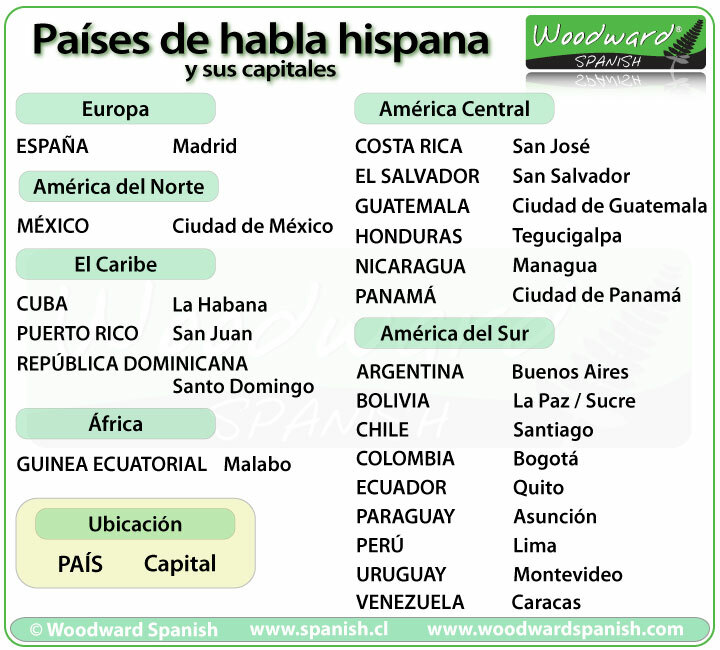 There is also a version of this game in Spanish: Juego de las capitales de los países de habla hispana. Usamos la frase “La capital de PAÍS X es …” y hay que elegir la respuesta correcta de 4 alternativas. Foldable Spanish name tags for desks or to be used individually for group activities (pinned to their tops). These are perfect for the beginning of the school year when you are learning the names of each student and also for substitute teachers. 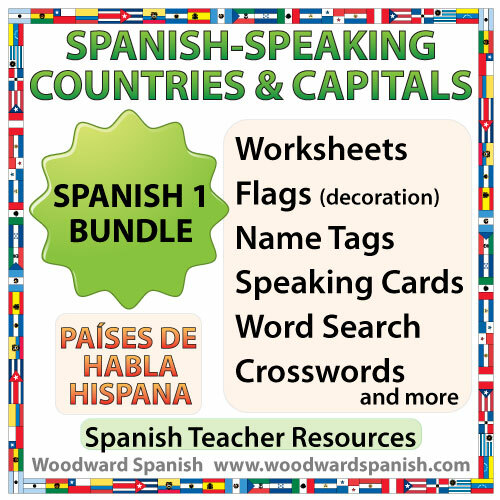 21 individual flags for decorating the Spanish classroom. You may also want to laminate the flags and use them as large flashcards. A variety of different activities including vocabulary building exercises (countries and nationalities), a cultural quiz, scrambled words exercises, mix and match activities and more. A class activity gets students away from their desks, interacting and speaking with other students in Spanish. A word search about Spanish-speaking countries and another about their capital cities. There are versions with clues and without clues. Two versions of a crossword. One version contains the flags of each Spanish-speaking country as the clue to complete the crossword and the other version has their capital cities.